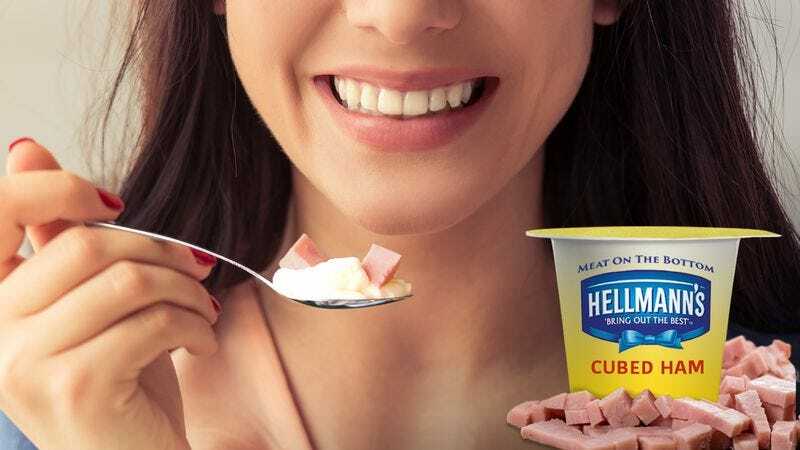 EAGLEWOOD CLIFFS, NJ—Describing it as a convenient all-in-one option for consumers in a hurry, Hellmann’s on Thursday unveiled a new meat-on-the-bottom mayo cup. “With a delicious layer of meat in every cup, you can now enjoy your mayonnaise without having to add your own ground beef or diced ham,” said spokesperson Owen Paquete, adding that the cups, which also come in buffalo chicken and smoked brisket flavors, were ideal for a breakfast on the go or a between-meal snack. “Some people immediately stir the mayonnaise and meat together so they can savor all the flavors at once, while others work their way through the mayo first and then treat themselves to a single decadent spoonful of meat and juices—honestly, there’s no wrong way to enjoy it.” Due to customer demand, Hellmann’s had at press time announced plans to expand the line with Greek meat-on-the-bottom mayonnaise cups featuring gyro shavings and souvlaki.